According to the assessment of Green Trees, the Ministry of Natural Resources and Environment and the Ministry of Information and Communication have been active in the first instance of disasters. Deputy Minister of Natural Resources and Environment Vo Tuan Nhan has presided over the first press conference on catastrophe, held in the evening of April 27, where Nhan said there are two possibilities for the mass death of the fish: The first is due to the effects of chemical toxins discharged from human activity on land and sea and the second, the phenomenon of natural anomalies combined with the human impact of the blooming algae in the water, also known as "the Red Tide phenomenon." He also said that "There is no conclusive evidence that points out Formosa as the main culprit for the said disaster." At the press conference on June 30, however, the government announced the culprit of the disaster, Formosa. The Minister of Natural Resources and Environment Tran Hong Ha said that the authorities identified 53 violations of Formosa. And nearly two months ago, on the 1st of May, Minister Truong Minh Tuan led a group of journalists, writers and bloggers to go and eat seafood in Vung Ang to prove that the sea was clean and the food was safe. On the Government's side, Prime Minister Nguyen Xuan Phuc announced on May 5 that "9 point guidance" on fish dead catfish disposal: "Request Ministry of Natural Resources and Environment, Ministry of Agriculture and Rural Development Coordinate with the Ministry of Science-Technology, Public Security, Defense, Industry and Commerce, Health, Vietnam Academy of Science and Technology to expeditiously and promptly identify the causes of the death of marine life." These developments have been reported by the local press as well as social media, and are reflected in the Green Trees report. 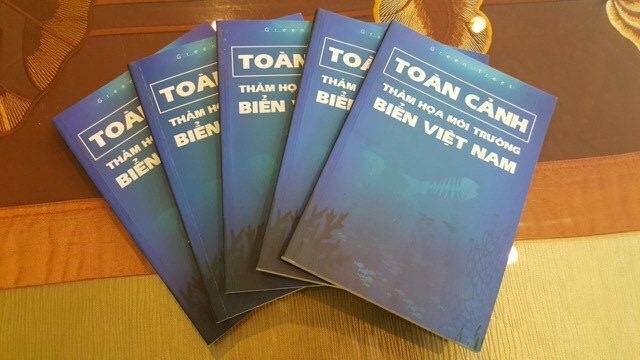 The report has eight chapters, 200 pages long, covering the 2016 Central Sea disaster from the legal, policy, scientific, economic, governmental and civil society aspects ... Last week, Green Trees sent five reports to the Office of the National Assembly and is expecting to have copies of the report contributed to the National Assembly delegates, for them to be more objective and to have a multi-dimensional information to prepare for the second session of the XIV session.